One of the secrets to a happier life as a gardener is to embrace your soil. As gardeners, we don’t always get to choose our soil. We end up with whatever soil, dirt if you prefer, that nature and/or a land developer has left us. And in that soil, we try to grow the plants we love. We like to talk about the soil we have, almost as much as the weather. Does any gardener have soil that they are proud of, that they embrace, that they brag about to their friends? Why do we seem to always lament the soil we have? I’m pretty pleased with my soil, overall. It’s not perfect, but I’ve learned to work with it, to embrace it, to proudly wear it on my hands and under my fingernails at times. Here are five ways to embrace your soil, whatever it is. Know your soil type and find out what grows well in it. There are many resources to find out about your soil type. You can start by looking at the general soil type for your state because most states have designated official soil types. My state’s official soil type is “Miami” and there are nearly 800,000 acres of this soil type in the Indiana. It’s a good bet that my soil type is “Miami” or something close to it. It’s a good soil, generally, fertile and productive. You can also contact your local cooperative extension service to find out about options for having your soil tested. As part of that process, they can tell what kind of soil you have, generally. Learn about soil and the life it holds, to understand how much more it is than the dirt that you bring inside on your hands and knees. When I was in college, I took a course in soil science, but I think it was mostly the study of pedology, which is about soils and soil formation. Now I’m more interested in edaphology, which is the study of the influence of soil on living things, especially plants. I recommend two books for your consideration. First there’s Teaming with Microbes: A Gardener’s Guide to the Soil Food Web by Jeff Lowenfels and Wayne Lewis. This was an early selection of the Garden Bloggers’ Book Club. Another interesting book is Life in the Soil: A Guide for Naturalists and Gardeners by James B. Nardi. If you thought soil was just inert matter, these two books will convince you otherwise! Take care for your soil. There are lots of things you can do to care for your soil, and none of them are that complicated. Add organic matter whenever you can, the cheapest being compost you make in your very own garden. Tread lightly and avoid digging when the ground is wet. This can mess with the soil’s structure for a season or more. And some people now recommend you till up the soil as little as possible to avoid disturbing the soil food web, if you even till at all. Protect your soil. Watch contractors and others doing work around your garden. A mis-informed contractor can ruin your soil before you realize it. Whenever you have someone digging around your garden, for a foundation, drive, pool, etc., make sure they don’t dump all the subsoil on top of your topsoil. Likewise, if you are fortunate enough to build your own home, watch during the construction process to make sure concrete, rocks, and other construction debris doesn’t get buried where you plan to have a garden. In fact, a good contractor will remove all construction debris from the site and never bury it there. And if the contractor mentions that he needs to bring in “fill dirt” to put where you plan to have a garden, ask him what he means by “fill dirt”, and then offer to pay for top soil instead. It makes all the difference in the world. i am always wondering how are you able to make so great posts. Filled with all needed information. Maybe you could advise us something? Great advise Carol. When I took the Master Gardening course I was dreading the "soil" part of the course. I thought it would be so boring. In fact it was one of the things I enjoyed most about the course. My eyes were opened to a new world. Soil is of course one of them most important mediums of gardening. This is a nice, good introduction to soil--a good addition to your "embrace" series. Now I'm gonna go give my yard a big hug. I've often said that I'm into gardening because I like to dig in the dirt. The flowers are just a bonus. I love the smell of it after a rain and I love mixing compost into it with my bare hands. Yep. I embrace my soil. It's the only way to stay "grounded". If you compost and add some well rotted horse manure to the soil, any soil can be improved. The problem is we can be a little impatient about our soil, as you say it's best to work with it rather than against it. Hi Carol, What an education I got from this post. Thanks. It seems we have Dickson soil here and the description does seem to fit. I wish I had read this post before letting the contractor dumpt the subsoil on top of the good stuff under the pine trees when we added on to the main house. That will never happen again, thanks to your good advice. Listen to her readers, stop those contractors! Carol, I should learn more about this topic, but I do know that I am very fortunate in the soil I have. Two years ago when I dug up a small area for my road side bed, I couldn't get over the rich black soil. This area had not been tilled for many, many years--it had been a pasture for a long time. Everything I've planted here has flourished, as you might expect. I had fair soil when I moved in, the "concrete when dry" variety. For my gardens I did not dig, I mounded truckloads of compost(that I got FREE from our local compost site) on top of the ground. Now I have fantastic garden soil! The plants do just fine being planted directly in this compost so I didn't even need to dig it in. My older brother, in Louisville, KY, wants to get started gardening and has asked for a beginner book for his birthday. Do you think one of these books on soil would be a good place for him to start? Sounds like he would like to begin with a small vegetable patch, and these guides to soil seem like great fundamentals, as well as interesting reading for someone of his more scientific temperament. If you know of other great gardening books for the Ohio River Valley region, please tip me off. Very psyched to have Miami soil beneath my feet! I am going to go out and hug my soil right now :). 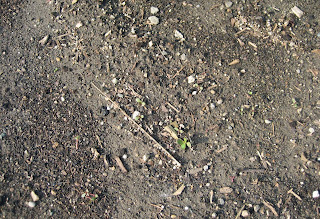 Case in point...I planted pepper plants in my garden, and the same day put some pepper plants in the side bed. (I accidently bought too many...can you believe it?) The pepper plants in my garden are flourishing and already producing. The pepper plants in the side bed are stunted and look pathetic. The only difference that I can see is the SOIL!